The scup (Stenotomus chrysops) is a fish which occurs primarily in the Atlantic from Massachusetts to South Carolina. Along with many other fish of the family Sparidae, it is also commonly known as porgy. 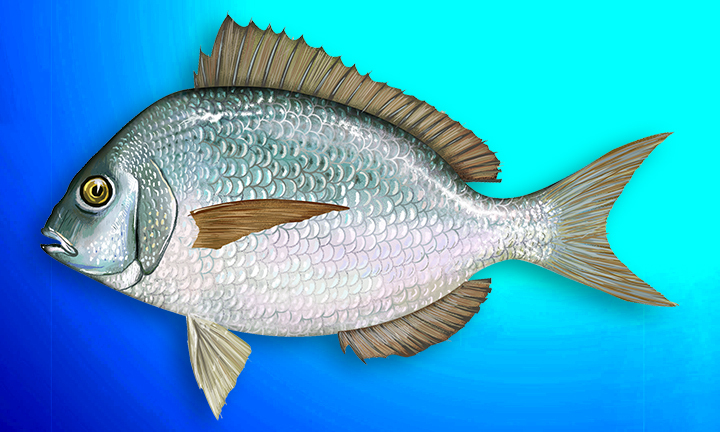 Scup grow as large as 18 in (450 mm) and weigh 3 to 4 lb (2 kg), but they average 0.5–1.0 lb (0.25–0.50 kg). In the Middle Atlantic Bight, scup spawn along the inner continental shelf. Their larvae end up in inshore waters, along the coast and in estuarine areas. At two to three years of age, they mature. Scup winter along the mid and outer continental shelf. When the temperature warms in the spring, they migrate inshore. They are fished for by both commercial and recreational fishermen.